What are the US Democrats’ big ideas? It wasn’t long ago that Julian Castro would have been considered a top-tier candidate for the Democratic presidential nomination. He was a well-regarded mayor of San Antonio, landed the keynote address at the 2012 Democratic National Convention and went on to a Cabinet position in the Obama administration. 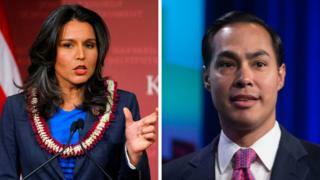 Even if Mr Castro isn’t quite the rising star he used to be – and, quite honestly, he has never been a particularly compelling public speaker – he still has the potential to build a following in the race to come. He’s a third-generation Mexican-American at a time when Democrats are desperate to engage the growing Latino population in the US. He’s young at a time when many Democrats are seeking generational change. As a moderate in a party moving to the left, however, he’s got his work cut out for him.